At the Beginning of the 80ies Arnold was a member of theThe Performing Arts Council of the Transvaal, and later South Africa State Theatre in Pretoria. He performed in classics like "Hamlet", but also in modern playes. first performed in: 1605, Arnold got his part in 1977, when he was fifteen! Comedy about a young noble with excessive lifestyle who does not care about God and morality, but recklessly seduces women and ends up in hell. Comedy evolving around mistaken identity. See here the detailed synopsis. The play is based on an incident in the early 1960s which involved the slaughter of the Cintas Tribe on one of their traditional feast days. In one single attack, virtually all members of the tribe were killed by sticks of dynamite dropped from a plane. The story focuses on a British government official, who is kidnapped by a local guerrilla group fighting against the military dictatorship, and who is very concerned about the native indians. The play combines comedy and drama, and it is a semi-autobiographical work by Fierstein. Although the play is about homosexuals, at its heart it is a play about family, love, and survival. Fierstein's play appeared just as AIDS was recognized as a major medical problem. His reinforcement of the importance of love in all relationships, hetero and gay, served to counter the attacks against homosexuals as promiscuous pleasure seekers. The play takes place in the army and deals with the experiences of the soldiers send to the border. A TV-adaption was made in 1989, written by Opperman as well, and starring Arnold too. 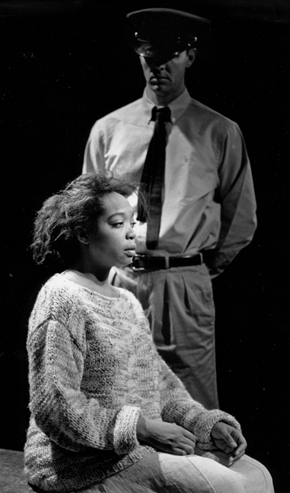 The play focuses on an University student (Glen) who claimes to be ideologically neutral, but in reality works as informer for the government; who seduces with his charm and intelligence, but in the end betrays the women just as the black people trusting him. The Biblical story about Salomé dancing for King Herod and demanding the head of John the Baptist as price. This is about the atrocious human rights situation in Uzbekhistan: the play features several actors and actresses with long careers in Hollywood, including Lisa Edelstein, Jacqueline Emerson, Greg Germann, Marianne Jean-Baptiste, Sally Kirkland, Dayo Okeniyi, Missi Pyle, Peter Riegert, Julian Sands, Arnold Vosloo, and Reno Wilson. The play tells the stories of various victims of human rights abuses in Uzbekistan, including ordinary men, women, and children who have experienced torture as well as the stories of activists, such as Elena Urlaeva, who face daily harassment and arbitrary detention for their legitimate human rights work. The Hollywood stars will read actual testimonies of victims of human rights abuses, Uzbek human rights defenders, and even the words of President Karimov himself on stage. The play also tells the story of how Human Rights Watch, the very last independent international human rights organization working in Uzbekistan, was expelled last year from the country. The closure of Human Rights Watch in Uzbekistan was the first time in its 33-year history that a government has forced the closure of one of its permanent field offices anywhere in the world.